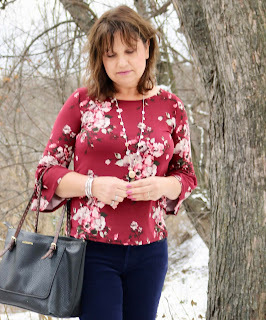 I received this bell sleeve knit top in my last Stitch Fix Box. 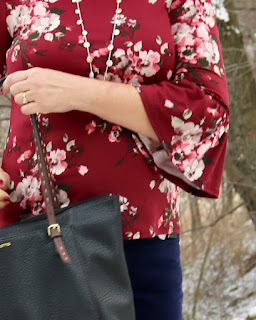 You may have already seen it in THIS POST where I styled the top with a pair of cords I also received in that box. The note my stylist left in that box suggested I wear it for the holidays. 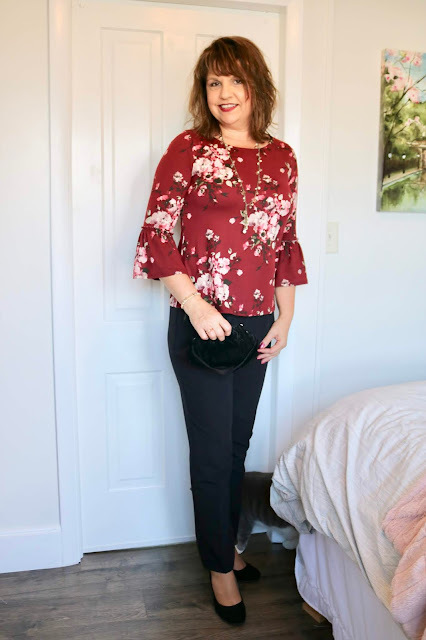 I didn't initially see it as a top for the holidays (other than the color) as I usually like something with more pizazz like metallics, sequins, or velvet, but I decided to try it out. 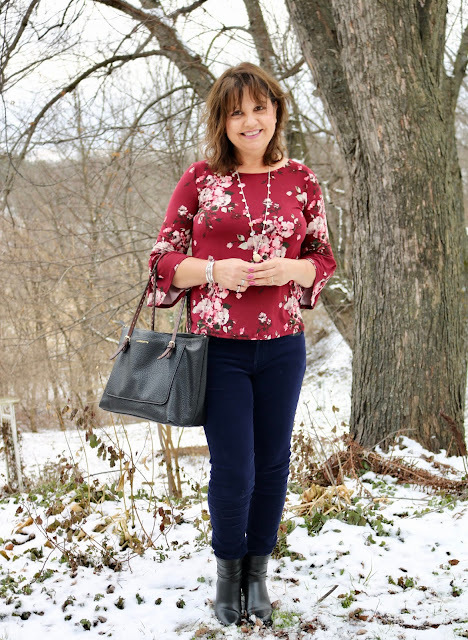 I think with the right jewelry, bag, and shoes, it makes quite a nice casual holiday look. 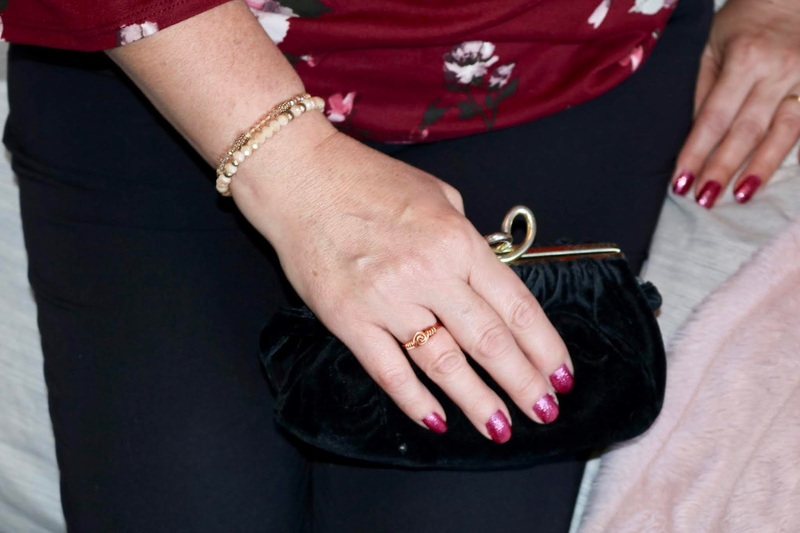 I styled the top with black dress pants (Worthington, old), a sparkly necklace and bracelet, and I carried a velvet bag. The color of your lipstick is so important when dressing for the holidays. It really completes your holiday look. Even if you're a neutral lip kinda gal, I encourage you to try a berry or red for the holidays. Here I chose a burgundy to coordinate with the top. I colored my nails the same berry color and I wore rose gold colored bracelets (old, Francesca's) and a rose gold love knot ring a friend made for me. The velvet bag is vintage. It's always hard for me to choose a necklace when wearing a busy blouse. I usually go with a choker or statement earrings, so I'm not competing so much with the top. This time though I went with a long beaded necklace that had similar colors that are in the top. This way the necklace blends in more with the top, rather than competing for attention. For shoes I went with these velvet suede wedge pumps (old). The top has a key hole opening in the back. 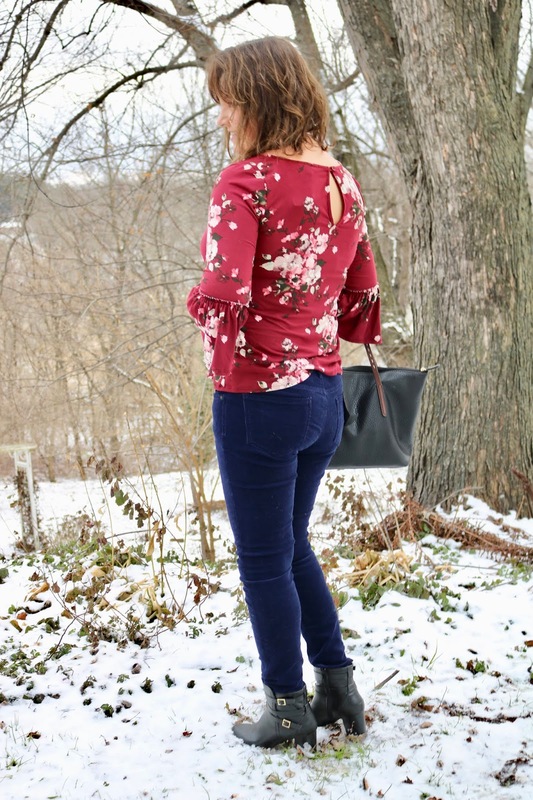 After putting this look together as my stylist suggested, I think it really would work nice as a holiday outfit; especially on a day if I'm just home with my family. What do you think? Was my stylist right? Would you like to try Stitch Fix? 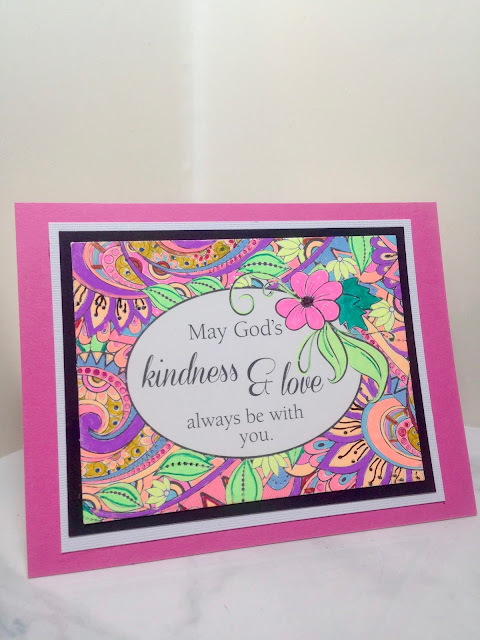 Did you know you can get $25.00 off your first purchase by using my Referral Code? Give it a try! What do you have to lose? 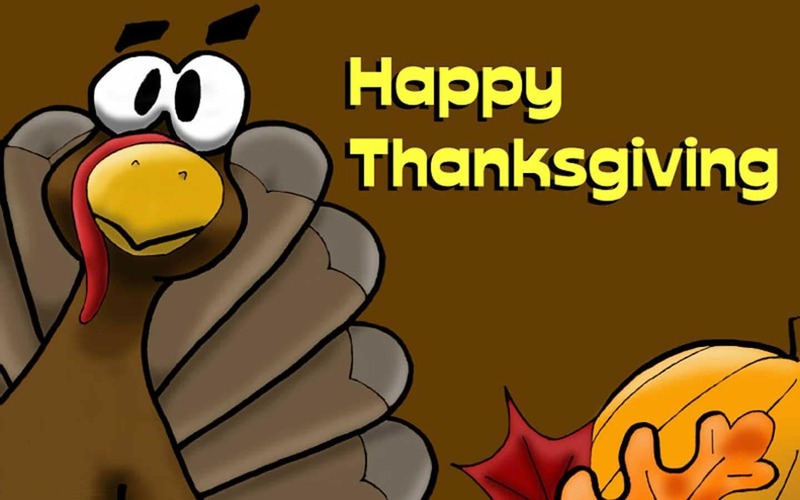 Have A Happy Thanksgiving Everyone! I am taking the rest of the week off to spend with my beautiful family! I will be back to my normal blogging schedule on Monday, November 26th. 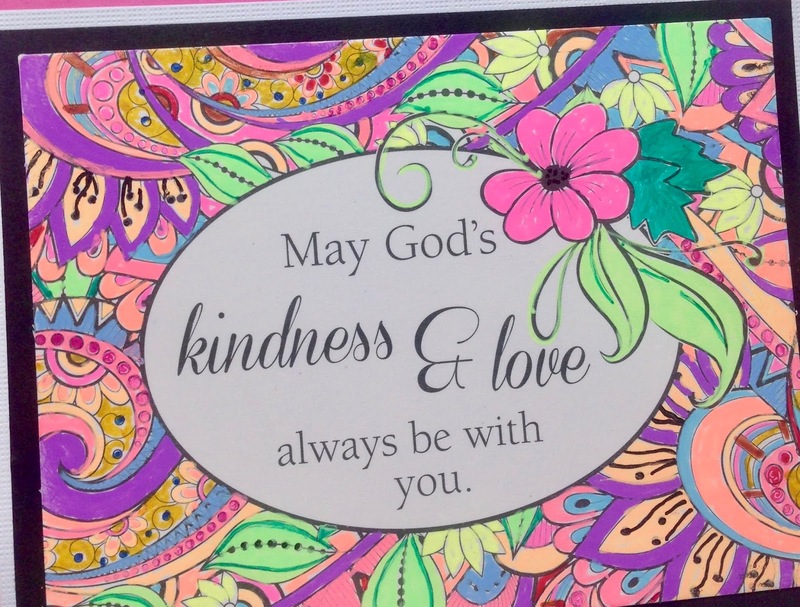 I have another "Colorful Blessings" card to share with you today. For those unfamiliar with "Colorful Blessings" they are card fronts that you color in yourself then make a card out of. I purchased them from Amazon. I thought this design had a real "1960's" feel to it, so I used brightly colored gel pens to color it in. 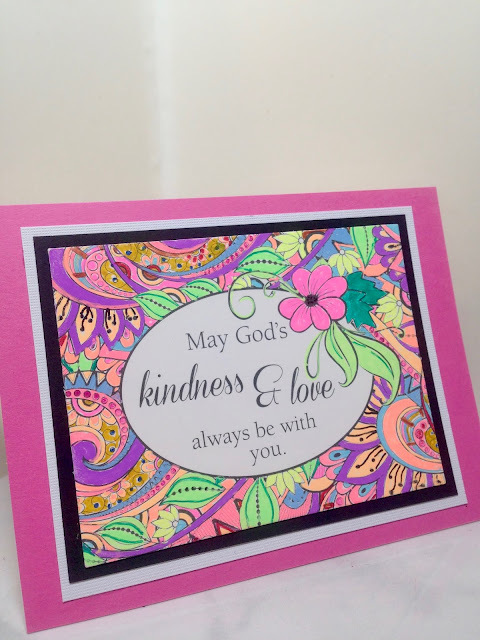 I popped out the colors even more by matting the card front to a black frame, then a white frame, and adhering the entire thing to a bright pink card base. 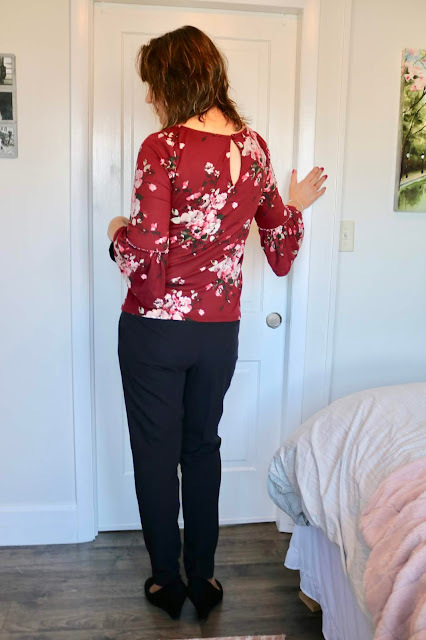 Since it's just a few days before Thanksgiving I thought I would do a humorous post on what to wear for Thanksgiving if you're the cook: and I emphasize the word humorous because this post is meant purely for fun. I don't wish to offend any of my other blogging buddies. About this time of year I see every style blogger doing a "What To Wear For Thanksgiving" post. And even though they usually give options: casual or formal for example, they are always so impractical to me. I wonder "Don't any of these women cook?" And even if they don't cook and they just "show up" to mom or grandma's house I would hope at the very least that they would "help" get the food on the table or clean up. Many of the Thanksgiving posts outfits I see are on the warm side: long sleeve chunky knit sweaters, blanket scarves, tall boots. I don't know about you but my house is hot, hot, hot on Thanksgiving Day because my oven has been on all day. I'm usually a hot, sweaty mess and I do not want to wear a sweater, tall boots and a blanket scarf. I mean, even if you don't lift a finger in the kitchen on Thanksgiving Day, you will not want to dress warm for my house when you come over for a meal. And then there are the gals who dress so fancy they look ready to go to a wedding. Really? Are there really people like that out there? I thought most Thanksgivings in America were very casual and usually involved eating then sitting in the living room watching football? Why do I need to wear a dress and high heels? I must live on a different planet because no family, rich or poor, I know has ever has celebrated Thanksgiving this way. And while were on the topic of "fancy clothes" can we put the bell sleeves away for just one day? I know they are super trendy, but talk about impractical for Thanksgiving! Yes, I can see myself cooking in the kitchen as my long, flowing sleeves fall into all the food. And even if your not cooking, it's still a issue. 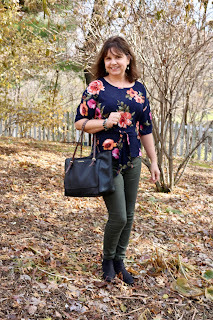 I remember last year a popular style blogger posted a "What To Wear On Thanksgiving" post on Instagram and one of her looks was a bell sleeve top. The comments were hysterical (although a little mean). Many were commenting how lovely the sleeves would look covered in gravy as they struggled to eat wearing such a top. I've also heard women say "Well I don't cook in this outfit. I prepare everything wearing more practical clothes then I change before the meal.". I'm thinking, "WHAT? How do you do that?" The thirty minutes before the Thanksgiving meal is the most stressful of the entire day. That's when you're trying to carve the turkey (if you carve it before you place it on the table), brown the rolls, make the gravy, and heat all the side dishes so everything is equally hot at the same time. Then I'm suppose to make everyone wait, while I "run upstairs and change" and the food gets cold? How rude and selfish is that? I don't know about your family, but mine is pretty excited to eat their Thanksgiving meal and they won't take kindly to the fact that I am going to make them wait to eat so I can "feel pretty". A dark floral tie front top with olive jeans. The top is "fancy" looking for the occasion but still practical because it has short sleeves and is a thin material. 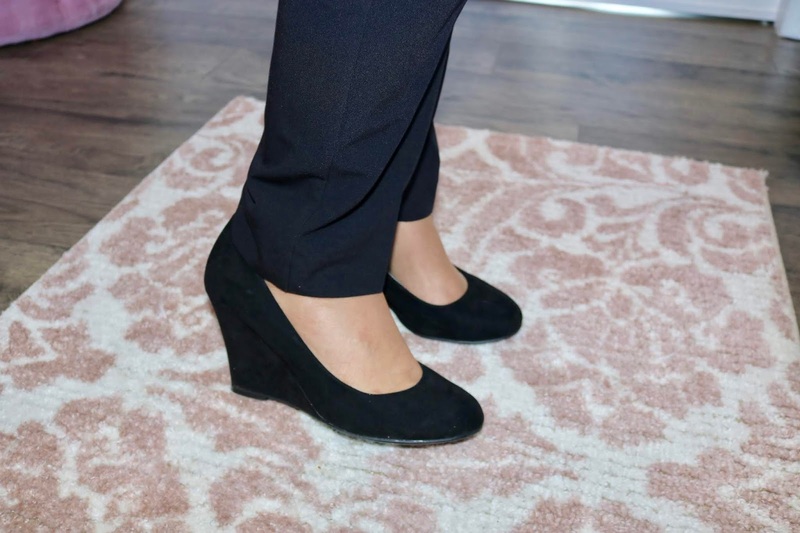 You could even dress it up more by wearing black dress pants. I think this is what I will be wearing for Thanksgiving. The top has pretty fall colors, short sleeves, and is cool and comfy. I might switch out the jeans and wear my new eggplant dressy leggings for even more comfort. Again, if you want to dress this outfit up more, just wear dressy pants and heels. Okay, I know there are some women who are always cold. I use to be one of you, but menopause cured that. A vest is a great option because it keeps your core warm but there is no additional bulk on your arms. The 3/4 length sleeves are also great for more of your arm is covered, but the sleeves don't get in the way. Another option is to wear a cardigan over a short sleeve top. You can take the cardigan off when you're in the kitchen, and then add it later when you're seated at the table or 'cold'. Wear a sleeveless top with a blazer. 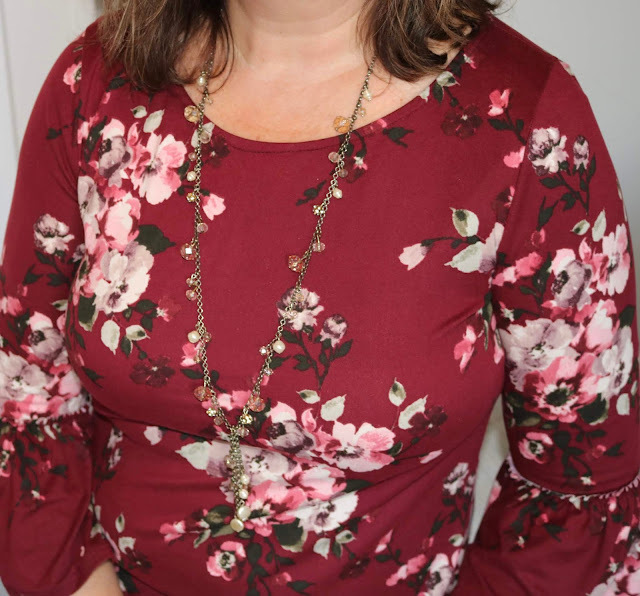 Just like the cardigan pictured above, the blazer can be worn to and from the event, taken off while in the hot kitchen, and worn when seated at the table. Okay, maybe you're one of those families that I've never met who really dresses up for Thanksgiving and you need a dress. 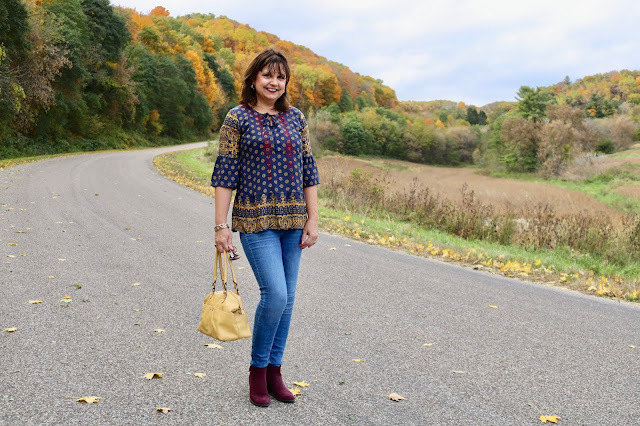 This is a short sleeve shift dress in a fall color that would be perfect for Thanksgiving. Add a cardigan if you need extra warmth. Well I hope I gave all the cooks and cook helpers out there some practical Thanksgiving outfits to wear. And to those of you who just get to show up for a Thanksgiving meal and eat, good for you. Enjoy! I will enjoy cooking and blessing my family with a delicious meal. What about you? What do you usually wear for Thanksgiving? I'd love to hear from you! 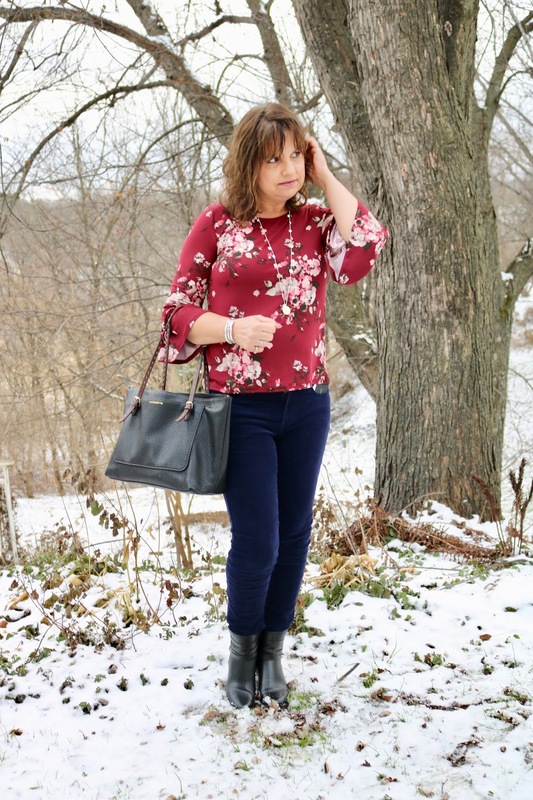 On Monday's Fashion Post, I reviewed three pieces from my November Stitch Fix box. Today I will review the last two items in that box and review my entire Fix letting you know what I kept and what I sent back. Before I begin let me say that this was probably the hardest Fix I ever had to decide on. It was so hard in fact that I created a poll on my Instagram stories to help me. Over 125 women participated in the poll, and they really helped sway my decision, because I kept one item I did not think I would keep when I initially saw my Fix, and I sent back one item I thought I would keep. Let's begin with the Instagram poll winner: this floral belle sleeve top. 90% of Instagram users said I should keep the top. 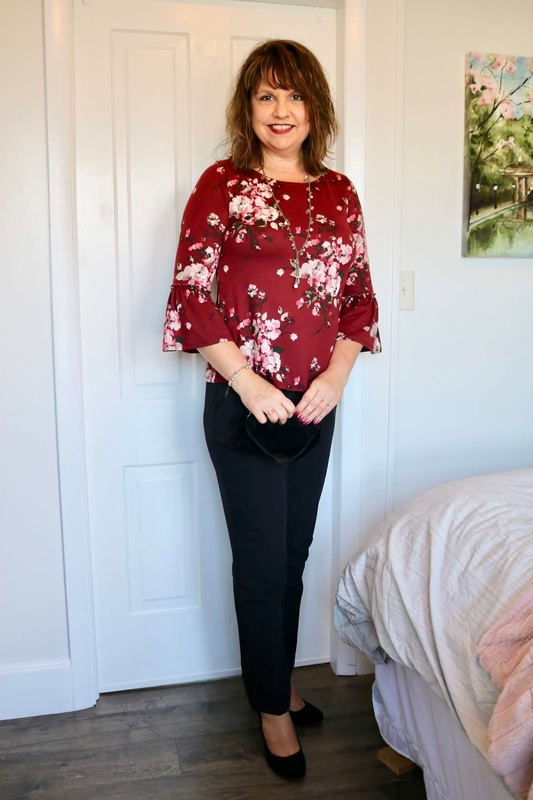 OK, I will admit when I peeked at the Stitch Fix website before my box arrived and I saw this top, I was already pretty sure I was going to keep it. It's an "Amy top": it's pretty, floral, and it has a lovely color and shape. It's also a comfortable thin knit so I won't get hot when I wear it and I can layer a vest over it. I love the belle sleeves and gorgeous floral print. And I was grateful for the burgundy background, because I have too much black in my closet already. My next item I was pretty sure I was going to send back when I saw it on the website and even after I tried them on. But you guys and my husband, changed my mind. These cords were the next most popular "Keep" item on Instagram. The reason I almost did not keep them was because they were "navy" and I thought "Why do I need them, I already own plenty of blue jeans?" But, depending on the light, they are not the same color blue as your typical pair of blue jeans. They actually look kind of purple at times. I also almost sent them back because the rise was a little low for me and they felt a tad uncomfortable. However, after I had them on awhile, they grew more and more comfy (they are a stretchy cord). I think they were just a bit stiff when I first put them on, but then they stretched a bit. 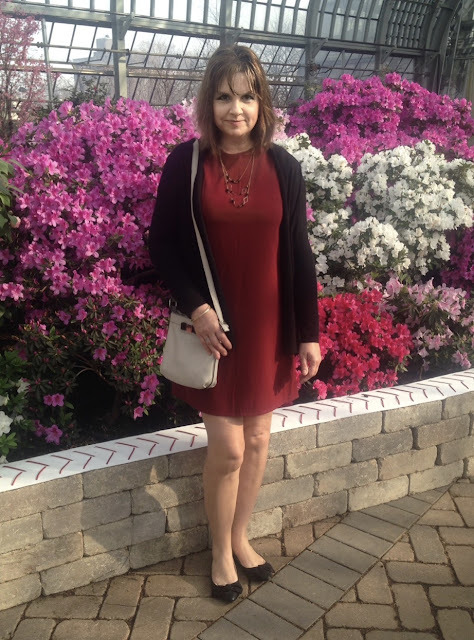 My husband liked the cords because he thought they really flattered my figure. And after I saw the pictures (Taking pictures of me in my Stitch Fix items helps me decide what to keep. Pictures show you a lot of things mirrors do not) I agreed. In some miraculous way, the cords lift up the buttocks and any woman over fifty needs that extra help! ha ha! I also kept the pants because would you believe I don't already own a pair of corduroys? Corduroy material is really trending now, so this pair of corduroy pants was a good addition to my wardrobe. So there you have it, the two items I kept in this Fix were this top and blue cords. Now let's review what I sent back and why. Lemon Tart "Kallen Ponte Puffer Vest"
I know, I can hear your screams now "I can't believe you sent this vest back!". I can't believe it either. You guys, I loved this vest. I loved it. It was so gorgeous and well made, BUT it was also very expensive ($88.00). I just could not justify spending that much money on a vest I would most likely only wear 2 or 3 times before the season was over. I already own four puffer vests, and even though none of those vests are as nice as this one, I truly did not need it. 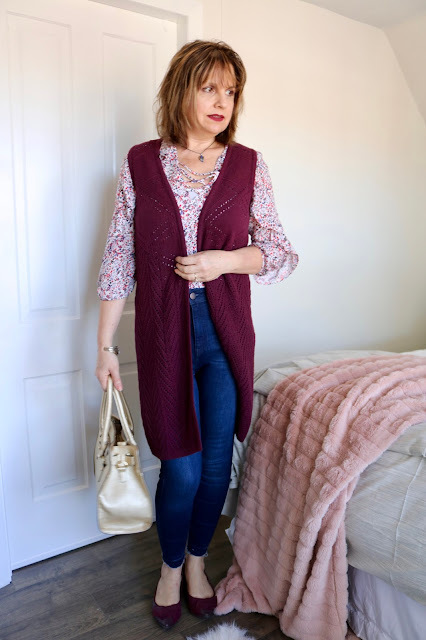 Sending this vest back was one of the hardest Stitch Fix decisions I ever made. I'm still not sure I made the right decision, as I loved this vest and I know I will never find anything like it in a store. The vest was not that popular on Instagram. Only 70% of pollsters said I should keep it. That also helped influence my decision. 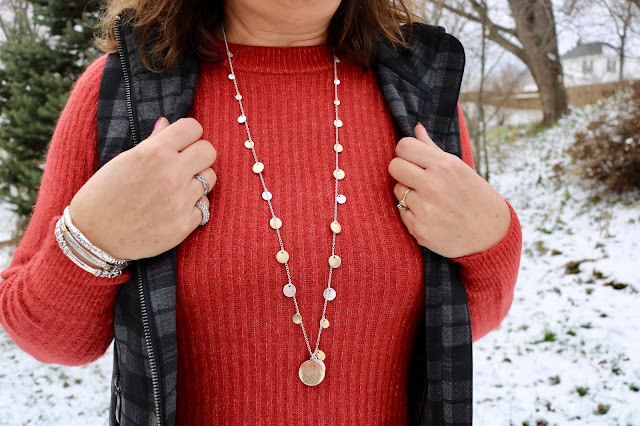 Marlyn Schiff "Newman Circle Charm Layering Necklace"
I thought this necklace was super cute. I loved the mix of silver and gold and the little circle charms. But, it was also very "cheap" looking in real life. The chain and metals were very thin. Now don't get me wrong, I don't mind wearing cheap jewelry. "Charming Charlies" and I are good friends. But, this necklace cost $34.00 and I could easily find a similar one at Charming Charlies for half that or less. Vero Moda "Leroya Crew Neck Pullover Sweater"
Fix. I loved the color, the length, and the thin knit, but I did not like the high crew neck and shoulder cut. It did not flatter me at all. Plus, I already own two sweaters that are a similar color so I did not need it. So out of five pieces, I kept two items: the floral belle sleeve top and a pair of blue corduroys. Do you think I kept the right items? I'd love to hear from you! 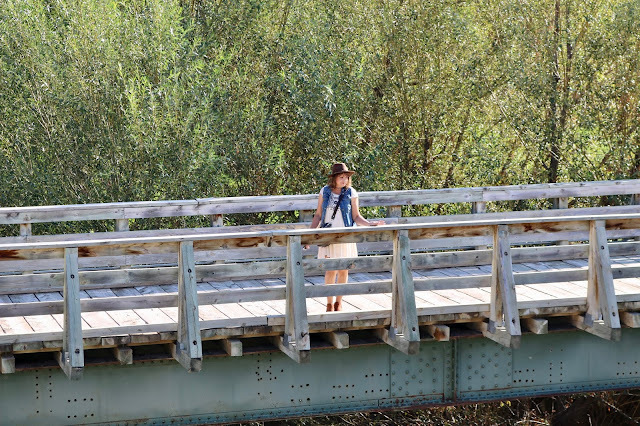 This is a continuation of a travel series to South Dakota. To start at the beginning, go HERE. Post two is HERE. On day two of our vacation to South Dakota we went to the historic wild west town of Deadwood. We did so much in a day and a half in this town that I couldn't possibly cover it all into one post, so I am dividing Deadwood into three posts: Part 1 will cover the town of Deadwood, Part 2 will cover the historic Adams House, and Part 3 will cover the Mount Moriah Cemetery. Deadwood originated as a gold mining town when in 1875 pioneer Frank Bryant was hunting deer and instead found a sparkling metal. Miners in search of a fortune followed establishing a town in 1876. Today the gold is long gone, and Deadwood is now a tourist town loaded with history for lovers of the Old West. We arrived in Deadwood very early in the morning, when most businesses were still closed. 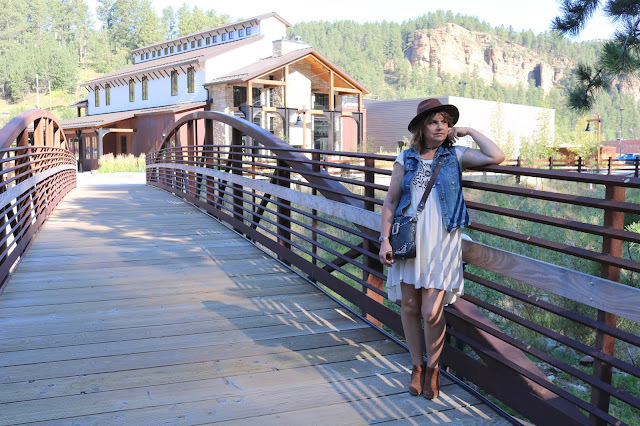 We decided to take advantage of the serene morning and took a lovely paved nature trail that was located behind the Deadwood Chamber Visitor Center. The trail ran along Whitewood Creek. It had two very pretty bridges with views of the "mountains" in the distance. The Chamber Visitor Center is housed in a gorgeous building. It contains all the usual information every Visitor Center provides, but there are also displays explaining Deadwood's rich history. It is a must stop before you begin exploring Deadwood. 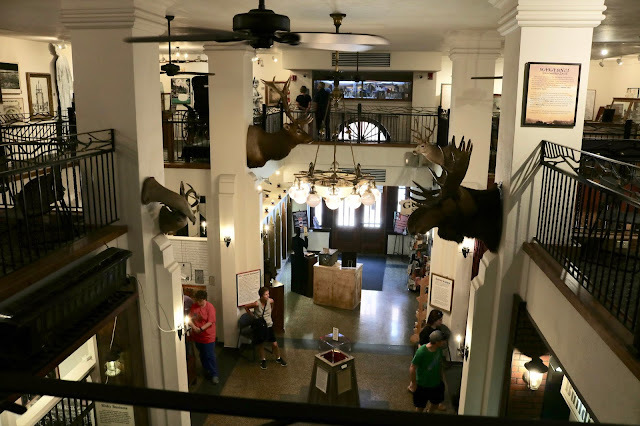 By the time we were finished touring the Visitor Center and walking the nature trail, the stores were opening up, so off we went on a walking tour of Deadwood. Most of the businesses in Deadwood are casinos or bars. There are some stores, but most are souvenir gift shops. As much as I enjoyed admiring the western architecture of the town, I was disappointed that there was not a lot of shopping. My husband and I don't gamble or drink, so other than taking the walking tour and learning the back history of the buildings, there was not much else to do on the historic main street. We were also surprised that there weren't any cute shops to eat or drink anything other than alcohol. There were no chocolate shops, ice cream parlors, bakeries, etc. ; the typical stuff you see in most tourist towns. Every business was either a bar, a casino, or a souvenir gift shop. This is an old gasoline station renovated for wine tasting. Even if gambling and drinking aren't your thing, Deadwood is worth a stop for it's stunning architecture alone. The entire city is a National Historic Landmark District. The buildings are so well preserved, and each building has a story to tell. Deadwood's past is well-known for its rough and rowdy crowd. It was a place where miners came to drink, gamble and spend some time with "ladies of the night". This bar/casino played up on that heritage by placing scantily clad mannequins in the upper story windows. You can take a guided bus tour of Deadwood for $20.00 per person. We did not take this tour. We picked up a brochure at the Visitors Center and did a self-guided walking tour instead. There is also a trolley that charges only $1.00 per person or $5.00 for an all day pass. It runs at regular intervals between all hotels, motels, and other key stops. There are a number of gorgeous historic hotels still operating in Deadwood. We stayed at a new hotel/casino just on the edge of the town(The Lodge), but we did pop in and check out the lobbies of a lot of these beauties. They really love to play up on the old west theme in Deadwood, coming up with a lot of creative titles for their establishments. The Franklin Hotel is the grandest old hotel on the historic main street. We went inside to check out the Victorian architecture of their lobby and it was stunning! There also have great food and restaurants here, guests can eat on the veranda pictured below or inside at one of their other dining options. Teddy Roosevelt, Babe Ruth, and John Wayne are a few of the famous guests who stayed in this hotel. This hotel used to be a Homestead Slime Plant in 1906. I just loved the western flair of this town. This is not a style one sees in the state of Wisconsin. We are more about log cabins, forests, pine trees, and deer. The Bullock Hotel is Deadwood's oldest hotel and is rich in ghost history. The ghost of Seth Bullock has been reported to be seen by many guests and hotel workers. The hotel offers ghost tours for the paranormal fans. Perhaps Deadwood's most favorite resident was Wild Bill Hickok, who was shot in the back of the head by Jack McCall on August 2, 1876 at this saloon. You can walk in and just take pictures of the saloon, but they ask for a small donation or store purchase if you do. They also offer paid, guided tours. And of course the place they captured the assassin of Wild Bill is important too! After taking the walking tour we were pretty hot and tired and thought it was time to cool off in the local museum. The Adams Museum is free admission but they do request a donation. It felt wonderful to enjoy some air conditioning and read about all the wild characters of the town like Wild Bill, Calamity Jane, and Potato Creek Johnny. For a free, little museum, it was actually quite impressive. It told you anything you could possibly want to know about the town's history and it's famous residents. A narrow gauge railroad was established in 1888 to serve the interests of the mining companies. In 1902 a portion of this railroad was electrified to carry passengers. In 1930 the railroad was abandoned but there is a historic train station still in Deadwood today that now serves as a Visitor Center. When we were done touring the museum and we were refreshed and renewed, it was time to head over the Historic Adams House for a tour (more on that next week). On the way there we saw a few more historic buildings of interest. And that concludes Part 1 of our visit to Deadwood. If you love historic homes, be sure to come back next week when I will be sharing stories and pictures of the Historic Adams House.